Nong Shim second stage honors go to China: The second stage, in which the fifth to ninth games are played, of the 19th Nong Shim Spicy Noodles Cup was held in Busan in Korea from November 24 to 28. The first stage was dominated by Shin Minjun 6P of Korea. He also won the first two games of the second stage, taking his winning streak to six games. However, Dang Yifei of China then took over, winning the next three games, so China staged a recovery. Japan is down to its last player, Iyama Yuta, who will meet Dang in the first game of the third stage, scheduled to start in Shanghai on February 26. Korea has three players left and China two, so Iyama will need to reproduce his good form in the LG Cup if Japan is going to avoid early elimination. Full results for this round follow. Game Five (Nov. 24). Shin Minjun (W) beat Chen Yaoye 9P (China) by 4.5 points. Game Six (Nov. 25). Shin (W) beat Yamashita Keigo 9P (Japan) by resig. Game Seven (Nov. 26). Dang Yifei 9P (China) beat Shin by resig. Game Eight (Nov. 27). Dang (B) beat Ichiriki Ryo 8P (Japan) by resig. Game Nine (Nov. 28). Dang (B) beat Kim Myeonghoon 5P (Korea) by resig. Ri Ishu wins Young Carp: The main section (the best 16) of the 12th Hiroshima Aluminum Cup Young Carp Tournament was held in the Western Honshu Newspaper Building in Hiroshima on November 25 and 26. This tournament is open to players 30 and under and 7-dan and under. The finalists this year were two Nihon Ki-in players of Taiwanese birth, Ri Ishu (Li Yixiu) 7P (aged 29) and Yo Chito (Yao Zhiteng) 4P (aged 19). Playing black, Ri, who came second in the first cup, won by 3.5 points. First prize is 3 million yen (about $27,000). Xie regains Women’s Honinbo: The 36th Women’s Honinbo title match, a best-of-five, went right down to the wire. Xie Yimin, the challenger (right), twice took the lead, but each time Fujisawa Rina (left), the titleholder, caught up. The deciding game was played in the Special Playing Room on the 7th floor of the Nihon Ki-in in Tokyo on November 29. So far, Black had won every game. The nigiri to decide the colors was held again, and Xie drew black. After a hard-fought game extending to 307 moves, Xie won by 8.5 points. This meant that she took back the title Fujisawa won from her last year. 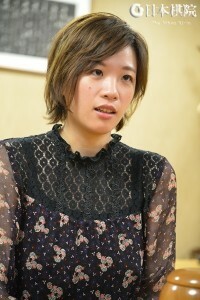 It was the eighth time she had won the Women’s Honinbo and her 27th title overall. After the game, Xie commented: “All the games (in the series) were tough. I made lots of mistakes after going into byo-yomi, so I need to improve here. This year I lost the Women’s Meijin title, the Hollyhook (Aizu Central Hospital) Cup, and the Senko Cup to Fujisawa, so I really wanted to win in the final title match of the year. Not giving up until the end worked out well. I think I was lucky.” Fujisawa is still the top woman player, with three titles, but this win restored Xie to her customary position of multiple titleholder. Fujisawa: “Most of the games in this match were tough. I made lots of mistakes in the final game, so the content was not very good for me. I think your mistakes show your level, so I’ll have to start out from scratch again.” First prize for this tournament is 5.5 million yen (about $51,000), the third-highest of the five women’s titles. Honinbo League: The first game in the third round of the 73rd Honinbo League was played on November 30. Taking black, Hane Naoki 9P (age 41) beat Shibano Toramaru 7P (age 18) by resig. This was Hane’s first win and Shibano’s second loss, so they are even on 1-2. The only undefeated player is former Honinbo challenger Ida Atsushi 8P on 2-0.